At Appliance Repair Experts, we have experienced technicians on duty who can fix any freezer repair problem you may encounter. We understand that freezers are filed with expensive food, and your repair needs to be completed quickly and accurately in an effort to save your frozen goods. Our expert technicians are ready to help, Monday through Saturday from 8 AM to 5 PM. If you have a broken freezer, we can fix it. Owning a freezer is a great way to save money. Freezers allow you to purchase items in bulk, reducing the overall cost of your grocery bill. When properly sealed, meats, vegetables and fruits can all be stored safely for up to a year in your deep freezer. That’s how important this appliance is to you! Life without a working freezer can be tough.contact us today if your unit isn’t running properly. Many common freezer problems can be solved without service, which can save you time and money. Here are some of the most common freezer issues and how to solve them. Make sure that your freezer is plugged in and the circuit breaker has not popped. One of the leading causes for freezers not working is that they are not receiving power. Check the air flow around your freezer. All freezers require space between the wall and the unit to allow the mechanical parts to receive air. This air flow helps keep mechanical parts cool and running. Check the reset button. Many newer models have a reset button for when a power surge occurs. Make sure nothing is blocking the door from closing. If the freezer is cracked open even a little, the contents will not freeze properly. Check the thermostat. Sometimes when you are moving around the freezer, the thermostat may be bumped and reset to a lower temperature. 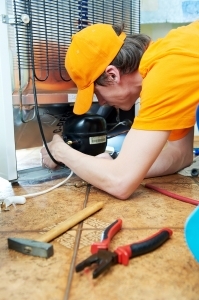 Most freezer repairs are easy to complete and can be done by one of our skilled technicians in a very short time. We fully stock our repair trucks with all of the necessary parts and tools they will need to complete your repair. We aren’t done until you are completely satisfied. We will get the job done efficiently and effectively, the first time around. That’s what sets us apart from all the other appliance repair companies in town.